e-Portfolios are coming. But how much do teachers really understand about e-Portfolios? How will it change Teaching & Learning? How will it affect working conditions? Do parents have a say in all of this? And what do students think? Although Vineet Madan does not even mention ePortfolios what he does say makes a lot of sense, for schools of all age-ranges, not just Higher Education, upon which he focuses. "Increasing engagement is about much more than simply entertaining our students with new devices and whiz-bang multimedia; it's about accomplishing the very real task of connecting them more closely to their coursework, to their teachers and to each other. Technology enables biology students to touch, spin and explore the structure of a molecule as they're reading about it in a text, watch a speech by Dr. Martin Luther King as they read about the civil rights era and ask questions of their classmates and complete their homework assignments all in a digital environment. By fostering these connections, technology can enhance and increase students' learning interactions, leading to better performance. "To teach our students effectively, we first have to learn about them. One of the best ways to do this is to use technology to collect data that tells us where they're strong and where they're weak, how they learn best, and use this data to create personalized pathways to help students build their knowledge and skills.
" The simplest reason why we should continue our push to bring technology to our classrooms is also the best one: it works. According to the U.S. Department of Education and recent studies by the National Training and Simulation Association, technology-based instruction can reduce the time students take to reach a learning objective by 30 to 80 percent. In the world of higher education, where technology is adopted at a much faster rate than in K-12 schools, adaptive learning systems such as LearnSmart have already been shown to have a significant impact on student pass rates, retention rates and overall academic performance. This improved level of performance has implications far beyond the classroom. Today we live in a global, digital society, and increasing students' exposure to technology can not only help them develop the skills they need to succeed in it but open them up to a world much greater than their own." For those of us who understand the ePortfolio culture, we can say 'Amen' to all of the above. eFolio is one of the best ePortfolio systems for providing the feedback, ownership and flexibility that Vineet is writing about. I find it inconceivable that in this day and age anyone should be expected to produce paper-based Portfolios. However, I have attached this YouTube video hoping that readers will play the game of attempting to work out how many problems can be overcome by producing an electronic version, ie an ePortfolio. For instance, can two or more people see this at the same time? Can different aspects of the Portfolio be hidden/removed so as to make it more readable for different audiences? What about costs? or updating? etc... etc.. Above all, can a paper-based system really present the whole life-story of the owner? His/her multiple personas? Is there any possibility of providing feedback from peers or respected adults? Yet another well-intentioned YouTube video describing a limited application of an ePortfolio. When will people discover that the ePortfolio tool is for much more than a single purpose Showcase. Where is the feedback or Likert Scales? Where is the sharing or collaboration between a restricted audience? Where is the facility to present different personas to different audiences? Can the novice html builder create a site which gives various levels of 'rights' to internal- or external verifiers? I'm all for quality presentations BUT... we also need to recognise the full lifelong and lifewide aspects of an ePortfolio such as eFolio can provide. As a teacher, perhaps my biggest concern is that Teacher Training Colleges are encouraging a level of technical expertise (or lack of it) that young or newly qualified teachers will assume is normative in Secondary or even Primary schools. Which ePortfolio tool for staff and students? Although I think that in principle your response is logical, it is also both introspective and contradictory. For instance, you list Lifelong Access (or rather ownership?) as being a requirement and yet you apparently require an institutional repository. Will the Nursery or Primary school maintain the lifelong support? Or multiple repositories as one moves through life? 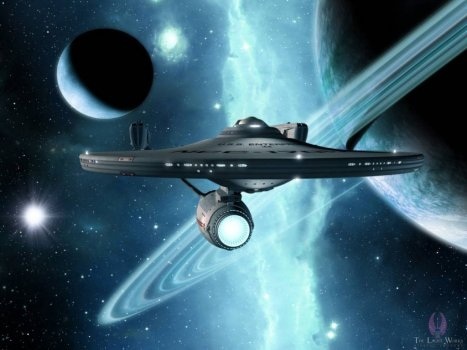 You require integration with Moodle - but what about the other 50+ VLEs? And what of the learner? Every person is different and has different skills and ways of representing themselves. I fear that an institutionally based assessment tool will not allow the individual freedoms of self-representation that I support with eFolio. You do not clarify if your hypothetical ePortfolio system is for institutional use with all the facilities required for rubrics, submission dates, overdue flagging, assessments and sign-offs etc and therefore institutionally owned or is it for ownership, collaboration and self representation etc? You suggest that it should be free and at the same time lifelong. I am amused as to what support a 5-year old or ancient granny will get from a system that is free. Are you assuming that there is no on-line staffing to support maintenance, monitoring, upgrading and technical help. These are all significant costs that have to be paid for by someone, somewhere. Wikipedia unfortunately gives a really out-dated and rigid definition of three distinct types of ePortfolio. We are now in the age of the cloud and should see our ePortfolio tools in this light. Another requirement of the personally owned ePortfolio is that of the ability to present different 'views' or personas to different audiences. This is essential when presenting one's ePortfolio to different clients or potential employers whereby the learner is able to represent (or re-present) themselves as having different characteristics according to the job-specification etc. I recently attended a conference which was purported to address the cost benefits of ePortfolios. It was an excellent conference but focussed specifically on a range of institutionally owned and operated assessment tools. These related to specific courses of study for a particular type of student and possibly where assessments may support a learner taking a number of qualifications by different examination boards. 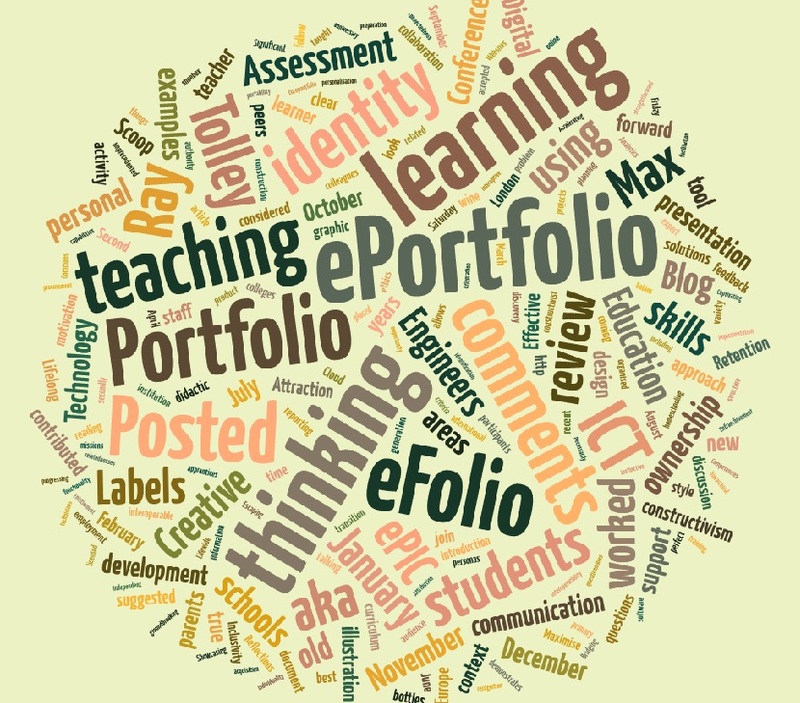 Until such time as we are able to contain all the aspects of assessment within the VLE we will continue to have this confusion as to what an ePortfolio really is. For me I would argue that the ePortfolio is NOT an institutional tool, although it may be encouraged by the institution. Just think, do we only advise one form of mobile device? Do we only demand one form of note-taking? Or research method?... etc etc. 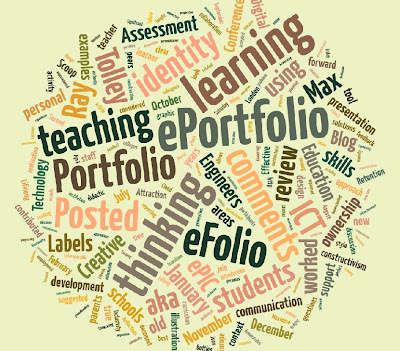 The ePortfolio, I suggest, is a tool that can provide and support evidences of rich-media artefacts, dialogues, evidences of collaboration and blogs etc which the student uses to supplement the in-house assessment system. This way the conundrum of ownership is resolved. I have long maintained that so-called disruptive technologies are only that for the slothful teacher who is not willing to recognise that Teaching andd Learning strategies are changing. For those educationists who DO recognise that we must move on in terms of teaching styles, that learners my benefit from a different combination of learning styles on two different days then and only then can we move on. The wise teacher will recognise that mobile devices, self-paced learning, collaborative pedagogies, cloud-based systems and intelligent PLEs are but tools to assist their dreams. I argue that the ePortfolio is the central hub that can make all of the potential changes in Teaching and Learning become effective. - And, I would suggest, within the next few years. A new 'Wordle-type' toy but an analysis of my work over the last three years. Obviously many words we would expect to see on a blog dedicated to ePortfolios and eFolio in particular. It would be a good exercise to check up on the more obvious words, using the search function at the top of this blog. A welcome to new readers from several countries who have joined us, particularly from some of the smaller islands off the east coast of the USA. Over 14,000 readers from 141 countries at the last count. - Check out your country (bottom right of the blog). Nice one! From LaGuardia, a good clear report on ePortfolios in college, as far as it goes. Those of you that follow this blog will note that I haven't made any comments about their ePortfolios coming with them from Junior High, or for that matter taking their ePortfolios on with them throughout life. Trading as 'Maximise-ICT Ltd' I have been providing staff support in ICT for some 40 years. Although I consider myself to be a specialist for ICT at KS3/4/5, I have always worked closely with all staff in whole-school development. My particular concern is that ALL subject areas, admin staff, technicians and LSAs included, should be using ICT to maximise both teaching and learning. Now as a Governor in a large and popular Academy, we are progressing well in our mission to be at the forefront of ICT for teaching and learning including a groundbreaking cloud-based VLE. Since retiring from full-time teaching I have three parallel missions: To promote eFolio in schools and colleges and secondly, to use eFolio as a medium for support of homeschooling families who need help with ICT both for Learning and Assessment and more recently the promotion and development of PeerWise for schools. All works by the author, Ray Tolley at Maximise ICT Ltd, are licensed under a Creative Commons Attribution 2.0 UK: England & Wales License.